As a thank-you to viewers of Whedon’s indie romance In Your Eyes, the filmmaking team has been randomly giving away Apple TVs, Xbox Ones, and cacti. This is very Whedonesque. Most filmmakers are grateful for the support of their audience, but for the past few weeks, Joss Whedon has really been demonstrating his gratitude. 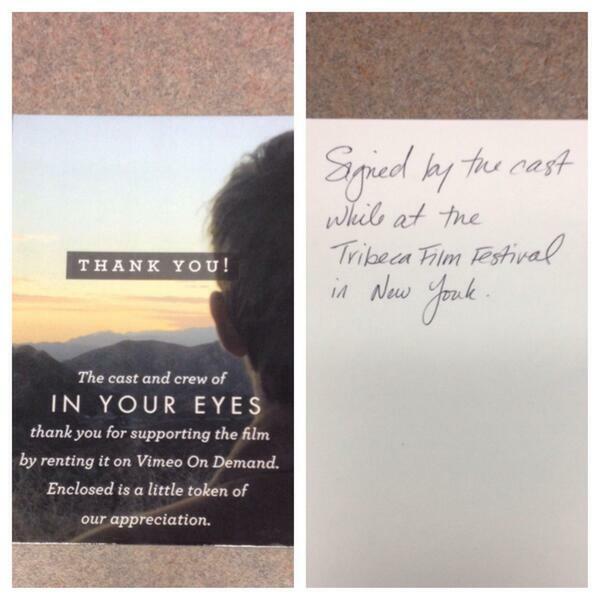 Last month, Whedon announced at the Tribeca Film Festival premiere of In Your Eyes — the supernatural romance starring Zoe Kazan and Michael Stahl-David and directed by Brin Hill (Ball Don't Lie), which Whedon wrote and executive produced — that fans could watch the film immediately by renting it for $5 through Vimeo. Since then, Whedon's filmmaking team has been secretly sending thank-you gifts to a random selection of fans who have streamed the movie. Those gifts include typical movie memorabilia, like posters signed by the cast. Got a surprise cast-signed poster in the mail from the new @josswhedon movie #InYourEyes. Watch it on @Vimeo Thanks! But they've also included Apple TVs. 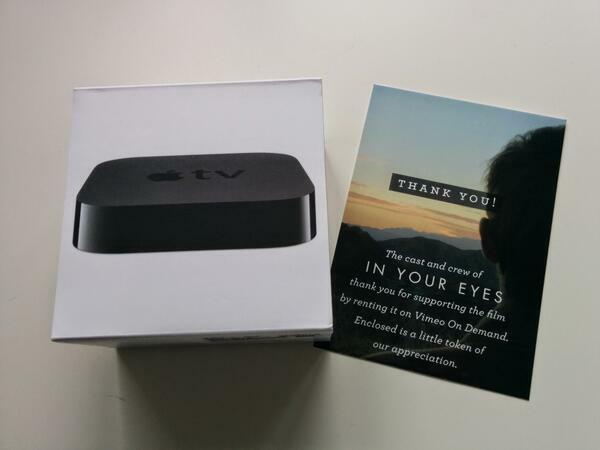 "An awesome thank you (Apple TV) from Joss Whedon's camp for supporting the film In Your Eyes! #InYourEyes #Joss Whedon #movielover #movies #vimeo"
So.. #Whedon&#39;s #InYourEyes just sent me a #XBoxOne as a "little token" for watching their excellent movie! So.. #Whedon's #InYourEyes just sent me a #XBoxOne as a "little token" for watching their excellent movie! 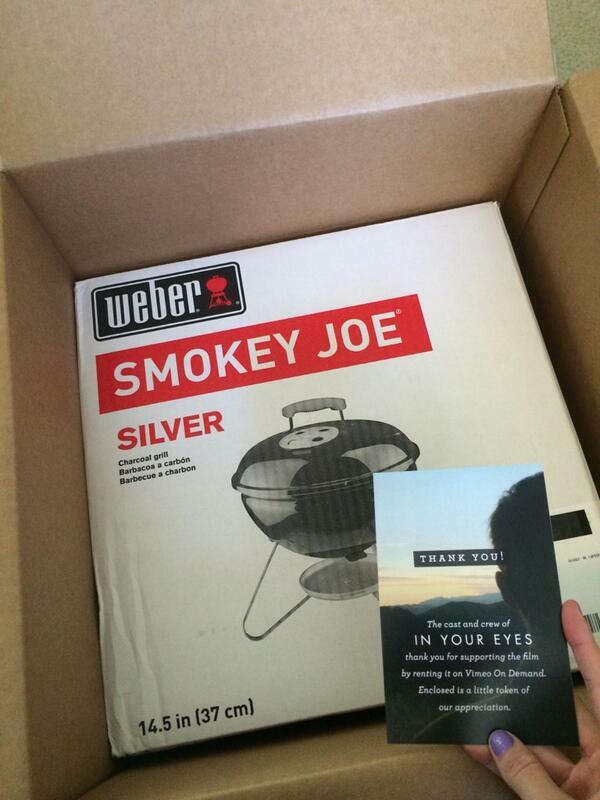 Rented @JossWhedon&#39;s #InYourEyes, got a fantastic quirky movie &amp; a Weber mini grill as a thank you!! THANKS JOSS! "Thanks to the #inyoureyes crew! I got a cactus!" It all started, said producer Michael Roiff (Waitress), when the filmmaking team began asking themselves, "What do we like? What would be our perfect world?" That world included being able to watch a movie you've heard just premiered at a film festival immediately from the comfort of your own couch, which is what led the team to approach Vimeo roughly six weeks before In Your Eyes' debut at Tribeca. But it also meant figuring out a way to give back to the film's fans in a tangible, delightful way. "The idea was we're doing something a little different, and we just want to say thank you," said Roiff. "Someone said on social media, like, 'Oh, it's almost like they got Kickstarter backwards and they're doing it in reverse.' That is sort of what we're doing, saying, you know what, this is working out, and we want to say thanks and give something back, and try to keep people talking so we can keep doing it this way." While the lucky recipients are chosen "very, very randomly," the team did put an emphasis on the fans who watched the film soon after it was available. "Obviously a lot of those are turning out to be big Joss fans." That isn't always the case. "There was one guy who said, 'This is weird, I rented this [movie], I didn't have a chance to watch it, and they sent me a Roku.'" In order to send the gifts, the In Your Eyes team (sans Whedon himself, who has been busy, you know, directing The Avengers: Age of Ultron) has been emailing fans directly for their mailing addresses, including many who live outside the U.S. "A lot of people write back saying, 'Oh, you probably don't mean me, I'm in the U.K. … or in Australia.'" And, indeed, the team has been sending gifts worldwide. Oh my holy moth balls! Thank you @josswhedon and the @IYEMovie team for my pressie for renting the film. Blown away! The &ldquo;In Your Eyes&rdquo; people sent me an AppleTV as thanks for renting the film! @josswhedon and team are the best! 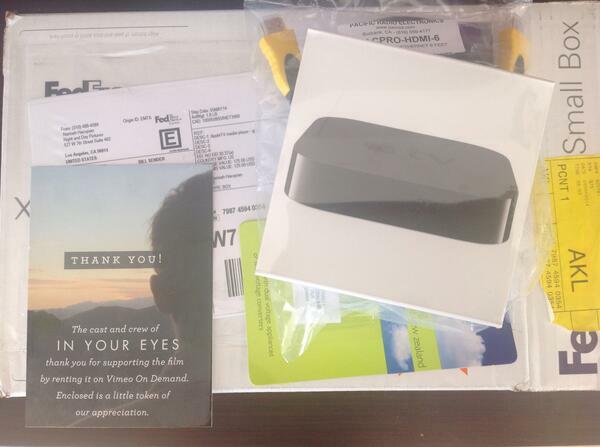 The â€œIn Your Eyesâ€ people sent me an AppleTV as thanks for renting the film! @josswhedon and team are the best! The gifts, including personalized thank-you videos from the cast, are being paid for by the proceeds from the film, so they've only been able to be sent to a very small percentage of viewers; Roiff estimates roughly 1,000 — so far. The plan is to keep sending out these thank-you gifts as long as enough people keep watching the film. "We can't send to a giant percentage of people because we would bankrupt ourselves," Roiff said with a chuckle. "But we're trying to make sure we actually get stuff to people, even if it isn't super-expensive stuff, like a cactus." Or, perhaps, something a bit more rarefied. "Because the whole movie is about seeing through someone else's eyes," said Roiff, "we've got a Google Glass we're sending to somebody. That one showed up at the office, and I was like, 'Come on, do we have to send that to someone else?'" The entire endeavor has been in the DIY spirit of what Whedon has been attempting to do since releasing Dr. Horrible's Sing-Along Blog online in 2008: cut down the distance between the artist and the audience. "What's been super about this project in particular is calling home to my mother and saying, like, 'I'm getting to play in the sandbox. This is more of what I came out here to do,'" said Roiff. "Usually, there are so many layers of people saying, 'No, you can't do that.' It's so cool to have people write back and say, 'This is awesome!'" He laughs. "It's been a lot of fun." Additional reporting by Ellie Hall.